Just three months before he died, Naftali Stern visited Yad Vashem on Holocaust Remembrance Day, 1978. 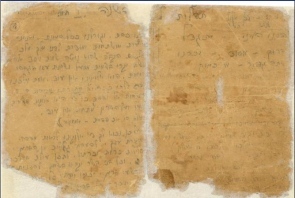 Naftali, an elderly man in his late 70’s, took out an envelope containing frayed pages; written on them were the prayers for the Jewish New Year (Rosh Hashanah Musaf), the longest in Jewish liturgy. Naftali proceeded to share his story. Prior to the Holocaust, he had lived in Satu Mare, North Transylvania, Romania, together with his wife and four young children. On a fateful day in May 1944, Naftali, his wife Bluma and his children were deported to Auschwitz and upon their arrival, Naftali was separated from his family. Bluma and the children were murdered in the gas chambers and Naftali, considered strong at 34 years of age, was sent to Wolfsberg, a forced labor camp in Germany. In Wolfsberg, the inmates, including Naftali, were forced to dig tunnels and trenches to serve as a defensible bunker for the retreating German army and high command. As the Jewish New Year approached, Naftali began to reflect upon the Rosh Hashanah services. He sold his daily ration of bread in order to obtain a pencil and some sacks that had held cement. He tore the paper sacks into small squares and began to write, from memory, the entire Rosh Hashanah service in a scrawl. The Nazi officer in the camp allowed the inmates to gather together and hold prayers for the Rosh Hashanah in lieu of breakfast. Naftali, who by virtue of his sweet voice had been a cantor in Satu Mare, led the services, an event the survivors remember as a special moment in the life of the camp. Naftali hid the pages on his body until his liberation in 1945. During the next 30 years, each Rosh Hashanah, Naftali held the crumbling pages under his right hand as he prayed.. After the war he rebuilt his life, established a new family and immigrated to Israel. As part of Yad Vashem’s commitment to the survivors’ legacy and ensuring that Holocaust education remains relevant, Yad Vashem annually hosts some one million visitors from throughout the world. During their visit they tour of the Holocaust History Museum where they see Naftali’s machzor, which has been expertly preserved along with thousands of similar pieces, each telling its own unique story with its own special meaning. Like the machzor, each story sheds light on the rich tapestry of European Jewish life prior to WWII and the rise of the Nazi regime; the vanished world of millions of Jews and the survivors incredible return to life. They leave the Yad Vashem campus spiritually fortified, ready to make commitments to strengthening Jewish continuity, to combating antisemitism, intolerance, and xenophobia. Each and every day Yad Vashem reaffirms its pledge to Naftali Stern and the survivors to share their stories. Your support makes it possible.